To see under starlight and moonlight, the retina of the eye changes both the software and hardware of its light-sensing cells to create a kind of night vision. 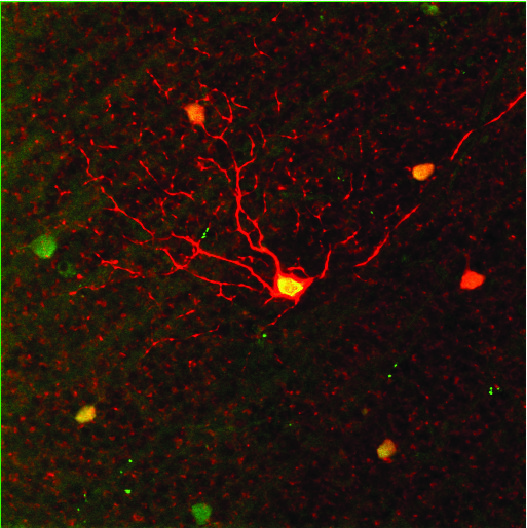 Retinal circuits that were thought to be unchanging and programmed for specific tasks are adaptable to different light conditions, say the Duke scientists who identified how the retina reprograms itself for low light. The findings, which appear early online in Neuron, show that the reprogramming happens in retinal cells that are sensitive to motion. Even in the best lighting, identifying the presence and direction of a moving object is key to survival for most animals. But detecting motion with a single point of reference doesn’t work very well. So, the retinas of vertebrates have four kinds of motion-sensitive cells, each specifically responsive to a motion that is up, down, right or left. When an object is moving in precisely one of those directions, that population of neurons will fire strongly, Field said. However, if the motion is halfway between up and left, both populations of cells will fire, but not quite as strongly. The brain interprets that kind of signal as motion going both up and left. “For complex tasks, the brain uses large populations of neurons, because there’s only so much a single neuron can accomplish,” Field said. In humans, these directional neurons account for about 4 percent of the cells that send signals from the retina to the brain. In rodents, it’s more like 20 to 30 percent, Field said, because motion detection is vitally important for an animal that other animals really like to eat. In a study with mouse retinas conducted under a microscope equipped with night vision eye pieces in a very dark room, graduate student Xiaoyang Yao in Field’s lab found that the retinal cells sensitive to upward movement change their behavior in low light. The “up” neurons will fire upon detecting any kind of movement, not just upward. When there is much less light available, a weak signal of motion from the ‘up’ neurons, coupled with a weak signal from any of the other directional cells can help the brain sense movement, similar to the way it interprets two directional signals as being a motion that is something in between. The loss of motion perception is a common complaint in human patients with severe vision loss. Field said this finding about the adaptability of retinal neurons may help the design of implantable retinal prosthetics in the future. For reasons that aren’t yet clear, it’s only the “up” cells that become motion generalists in low light. Field suspects that up is the most important direction for a prey animal to spot a predator that looms upward as it approaches its prey, but he doesn’t have that data yet. What’s important for now is that the eye and brain alter their computation of motion in low-light. “We’ve learned that large populations of retinal neurons can adapt their function to compensate for different conditions,” Field said. The retina consists of many circuits working in parallel, said Jeffrey Diamond, a senior investigator at the National Institute of Neurological Disorders and Stroke who also studies visual processing in the retina. “We’re learning that these circuits are doing different things at different times of day,” said Diamond, who was not involved with Field’s paper. Now that Field has found this one adaptation to low light that is driven by changes in both the circuitry and the chemical signals between cells, it begs the question of how many other adaptations are going to be found, Diamond said.